If you follow me on Facebook, you may remember a month or so back when I posted this picture. HomeRight offered a challenge to their brand ambassadors. 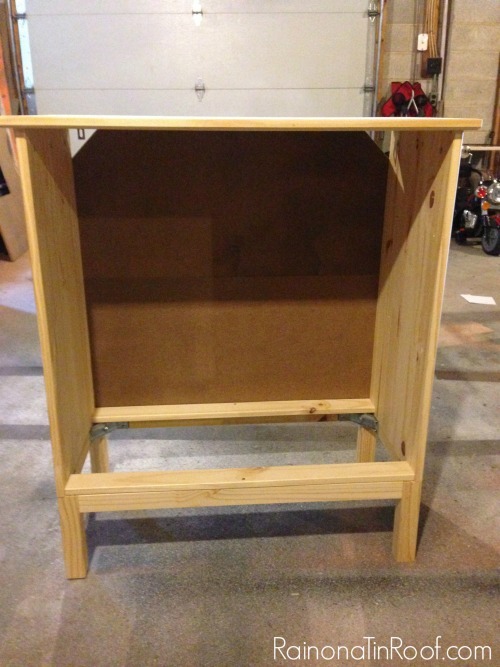 They offered to send us one of the IKEA Tarva 3 drawer chests and then have at it – An IKEA Tarva Hack. My fingers and toes and arms and legs were crossed in hopes that I would be one of the five chosen ambassadors drawn from a hat for this challenge. So what did I turn my chest into? To say that I’m happy with this piece is an understatement. I am still bouncing off the ceiling, throwing confetti, fist bumping the air excited about this piece. The second thing I did was construct the doors. I wanted to use as much of the wood as I possibly could from this piece so I used the drawer fronts to make the two doors. I let the glue fully cure for one day, then I flipped the doors over and filled in the gaps of what were the drawer fronts with wood putty. I also filled the holes that had been pre-drilled for the hardware as well. After the putty was dry, I sanded it smooth. The bottom shelf is pretty easy. All you do is measure the inside bottom of the frame and cut out a piece of MDF to that size. Leave about a 1/2 inch of clearance in the front so that those wood pieces (I’m sure there is a technical word for those, but you know I don’t do technical) on the back of your doors will have room. After you have your piece cut, run wood glue along the bottom inside edges of the chest and place your piece of wood on top. The photo above doesn’t show it, but you will need to put some weight on the shelf to make sure it gets a good grip with the wood glue and the chest’s frame. I did this with the super technical resourceful method of stealing landscape bricks from my yard and placing a few around the edges. After they were cut, I measured 8 3/4″ down from the inside top of the chest and put the pieces there. 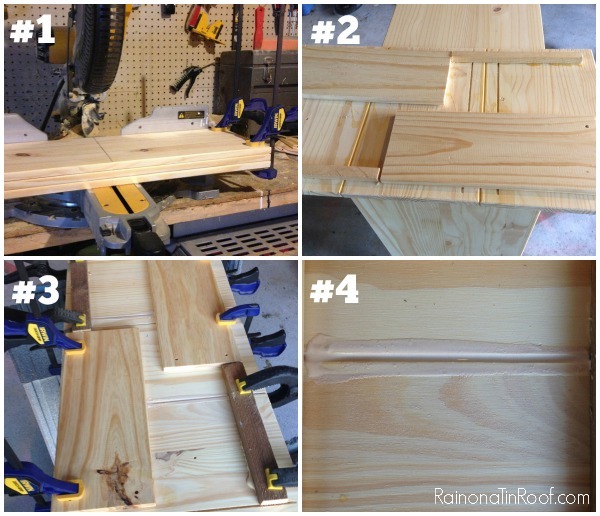 Apply wood glue to the back of the pieces first, then clamp them to the chest’s frame making certain they are level. 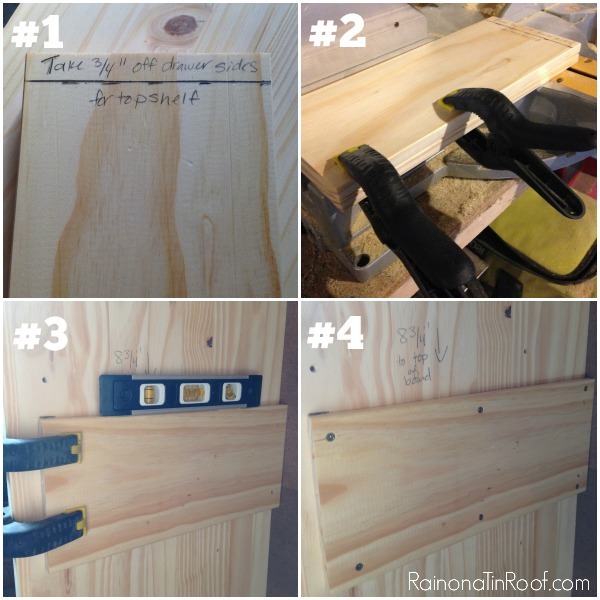 Use small screws to attach them to the frame and then remove the clamps. (#3 and #4 in the photo above.) Do this on both sides. Make the top shelf the same way you made the bottom one by measuring the inside of the chest. 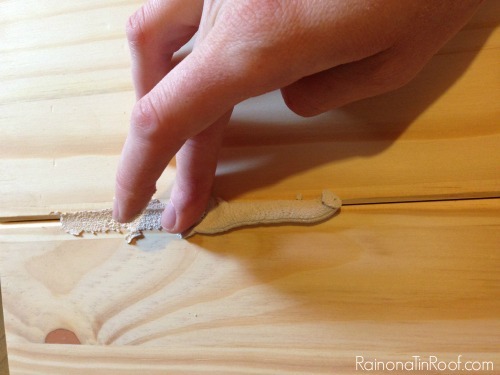 Apply wood glue to the wood pieces on the edges and then place your shelf on top and weight it down for a little while. 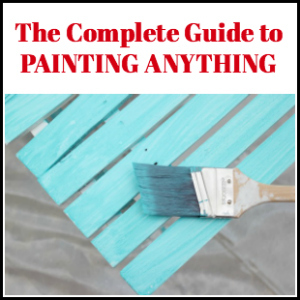 Here’s the fun and easy part – paint it! I used my HomeRight FinishMax Pro (which as you can see in the photo above works overtime for me) to paint this piece. The paint I used is a new find for me. It is called Velvet Finishes and requires no priming or topcoat. I used the Baroque color in my sprayer and gave the chest three light coats. The paint worked just fine in the sprayer – just needs watering down a bit. The sprayer gave the paint a flawless finish. After the paint dried, I used a dark glaze over the entire piece to give it a bit more dimension. *I must pause here and give a big thank you to Grunt Labor and Bill. Remember how I said the easy part was painting the chest? It totally was. Making the doors and shelves were pretty easy too. However, for me the hardest thing was lining up the hinges correctly to make sure the doors were even. Grunt Labor and Bill swooped in and saved me from an imminent meltdown on that one. Thank you, guys. I used two of the knobs that came with the chest, but I gave them what I’m proclaiming to be a “gold nugget” look with my HomeRight Heat Gun. I’ll post the tutorial for those soon. I also added flat L corner braces to the corners of each of the doors. See those gold nugget beauties? I added a towel hook on the back of one door for easy towel access and (more importantly) easy bottle opener access. I also spiced up the back interior of the cabinet with black and gold polka dotted wrapping paper. Disclosure: This post is sponsored by HomeRight. However, all opinions and love of the color green is 100% mine. This is fabulous. You are so creative. I would use this sprayer on EVERYTHING!!!!! Thank you, Liz! Honestly, I can’t believe it turned out so well. I wasn’t sure if the doors would work or not – but they did!! Our dining room table, six chairs, buffet and china hutch that were my grandma’s. It’s a hugely impossible job that I’ve been talking myself out of for the past couple of years. It’s time they needed an update!!!! Girl, I understand why you have been putting it off!! That is a huge undertaking with a regular paintbrush and roller! Good luck on the giveaway! Oh, my list could go on and on! I’d love to try out the sprayer on a wingback chair that I plan to paint navy. Wow! Loving it! Have shamefully been coventing one of these sprayers. I have dressers, book cases and tables I want to transform! Great ideas! I have an old cabinet-sort-of-thing that I got from a thrift store that I plan to turn into a bar. It’ll be quite tricky I think. I’ve had it for a very long time! Thanks for the inspiration! I’d love to use it on my kitchen cabinets. My son’s dresser and nightstand could desperately use this! Oh I love the gold accents! It is the icing on the cake! Definitely going to pin it for sure! What’s the scoop on this paint???? I’m all for not having to deal with a paint brush or waxing EVER AGAIN! Proud of you for finishing in the top five girl! We will all push for number 1 overall!! Hot Damn !! Thanks, Hope!! I don’t think it would have been complete without the gold accents. This paint is awesome!!! I’m actually going to be writing a detailed post about it tomorrow!!! Get excited! I do use it for everything!! Love it! Good luck, Chris!! Looks great. I have a few projects i could use that on. Thanks for the opportunity – my fingers are crossed. Thanks, Susan!! *insert 7th grease girl squeal here and fist bumps* haha!! Good luck – this sprayer would be awesome for your secretary! Thanks!! I don’t think it would have been as good without the l-brackets! 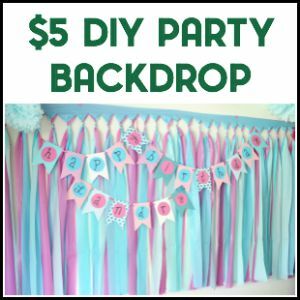 I love adding those to pieces – cheap and big impact! OMG…… I love it!! What an awesome job. Thanks for sharing and a chance to win. 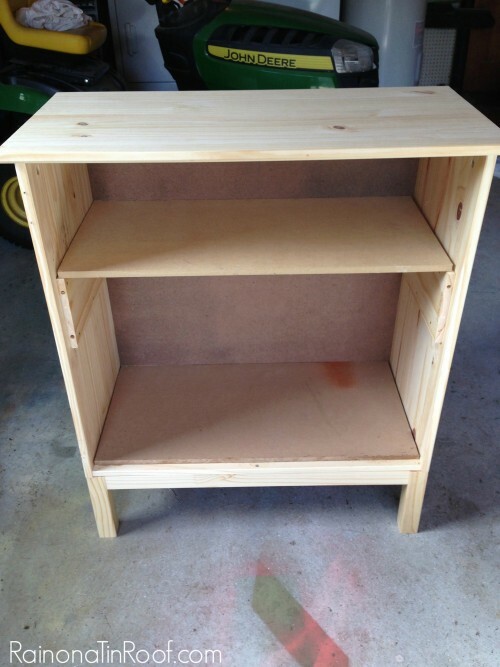 I have been buying some furniture on the cheap to re-vamp, so far, I have SO many projects that I am overwhelmed. This might really help my procrastination! Thanks for the chance! I am putting a new railing on my deck and a paint sprayer would save me loads of time. wow! Love your makeover especially adding the towel hook was a great idea. Gold accents in green background is perfect! I would use the sprayer on the entertainment center. Thanks for the giveaway! Wow that cabinet is so dang gorgeous. I know I keep saying this but you are so talented, I would never have thought to turn that into a cabinet, and I love the color. Well done. Thanks, Patty! You know, you totally give me an ego boost every time you say that? haha!! Honestly, I wasn’t sure if the cabinet idea would work – I had no clue if I could really make doors from drawers fronts, but it worked! yay! 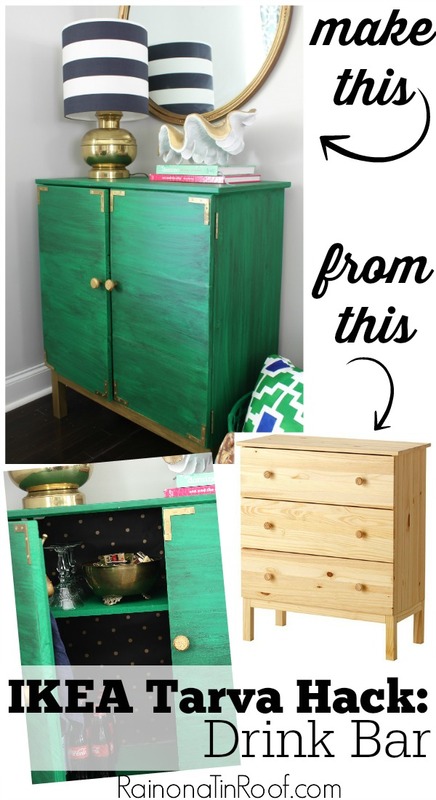 Jenna this is gorgeous…..not only did you paint it in my favorite color green but you made a chest of drawers into a cabinet….pure genius….I am so pinning this. Love the inside also. If I had a paint sprayer I’d paint all my “wood” furniture in the house from brown to something that pops, I’m sick of everything so brown in my house but I don’t want to leave streaks from the paintbrush. Thanks, Samantha! That shade of green is my favorite too – just can’t get enough of it! There are so many projects going on in my house right now, but I would love to paint my kitchen cabinets white, so that would be the first one. Great giveaway and love the drink bar. I have so many projects I NEED that sprayer for! I have a desk and chair that need a new paint job… that’s where I’d start with a Finish Max Pro, but I’ve got LOTS of projects from there! Thanks for the chance to win! Wow! What a difference. You have some imagination. You are so amazing, I’m a huge fan! I would love to buy one of these and do the same thing (unless you copyrighted this. In that case, I’d mix it up a bit) because I need a place to safely store my journals. THIS IS AWESOME! I advertised you on my blog!! Thanks so much, Savannah! I totally don’t have it copyrighted. It would be perfect for storing your journals. You are so sweet to give me a mention on your blog – thank you! I actually did check it out after your first comment! 🙂 And it is fabulous! And super inspiring! Keep it up!! What a beautiful piece of furniture! You have such great ideas, Jenna! I have a dresser that I have wanted to refinish and this would be perfect. 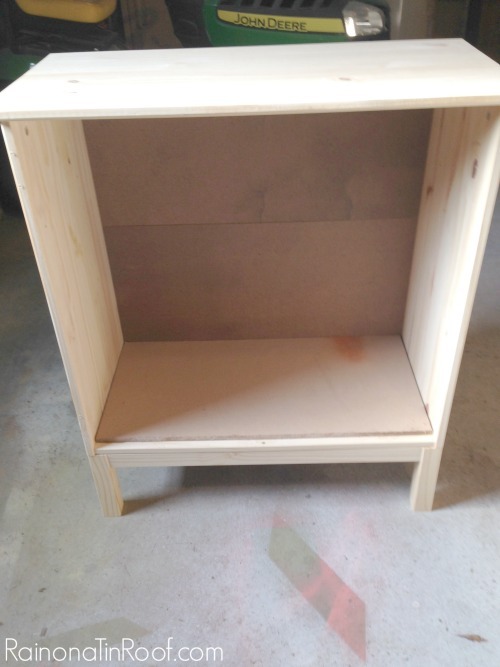 The FinishMax would make it so easy to paint my little girl’s dresser and desk! They are the last two projects to finish her bedroom’s recent makeover! I would use it on a table I want to makeover. I love this makeover transformation. This is amazing, Jenna! Love, love, love that gorgeous green! And I cannot wait to see how you made those knobs! If I won the paint sprayer, I’d give our kitchen table a much-needed makeover! Thanks, Emily!! I LOVE that color too! I’m glad you like the knobs, because I was a little worried I may be the only one in the world who liked them! I am so impressed with this, Jenna! I can’t believe those doors are made from the drawer fronts! You can’t even tell that there’s three pieces there! Awesome job my friend, I want a drink cabinet now!! Thanks, Chelsea! I was so worried the drawer front to door idea wouldn’t work, but I’m so thrilled it did! I love the Ikea Tarva- it is seriously so versatile! And this is an awesome way to decorate it! I’m also very intrigued by that paint sprayer- I feel like I could definitely use it a lot! Thanks, Nina! Yes, I love these Tarvas too – great for so many things, just like the paint sprayer! This sprayer would be very happy at my house! I’ve been eying some potential projects already : ). I love this! What a difference! I would paint the used coffee table I just found. I would use it for everything, but the first thing I would use it on is a chest of drawers! I LOVE the green and gold! I would use it on everything. 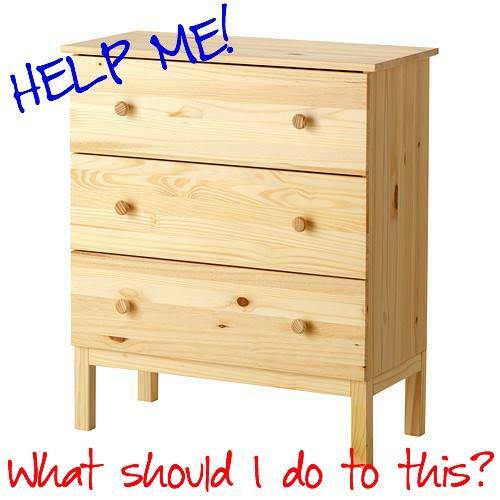 I would start with an old night stand. Thank you for the giveaway. I have a dresser/tv stand that desperately needs painting, but I can’t fathom doing it by hand! I have the Tarva bed frame that i could use it on. I would repaint a table top that I have. Love the way you transformed the dresser. I would never think to do that. Thanks, Jackie! I wasn’t sure how well it would work, but I’m so glad it did! I would love this for painting our kitchen cabinets. This is AMAZING! And TOTALLY channeling your Ralph Lauren barstools. Thanks, Heather!!! It totally reminded me of the Ralph Lauren barstools as well! Turned out absolutely fabulous! 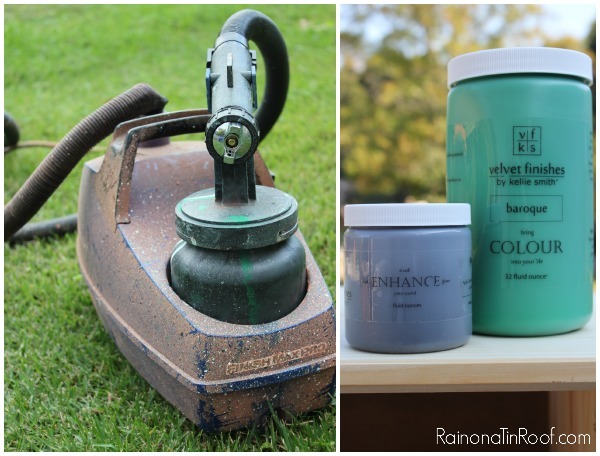 Love the color and am loving the fact that you are giving away a sprayer. Fingers crossed! I would use it to paint all of my furniture! I would use the FinishMax Pro on this old wooden bench my mom gave me that I have been wanting to paint for my hallway. What a great transformation!! I love the beautiful bright color. You always knock it out of the park! I have so many things to paint, but I think that I would start on my garage doors since it is finally starting to cool off here in Texas. Thanks! Thanks, Sherri! I’m in love with that color too! I have a great wooden hutch that could use this. Hello, I have a handed down large oval stained dark pine table from the 70’s, complete with leaves. I’ve always kept a table cloth on it but recently have thought of painting it, so that is what I will tackle first. Thanks for a great giveaway! A sprayer would be Life. Changing! My dining table is ready for a make over!! my BFF and i have some pallet projects that this would be awesome for! AWESOME project!!! A booze cabinet is a great idea, and I can’t believe you got such a gorgeous one, out of such a blah standard furniture piece!!! love it! 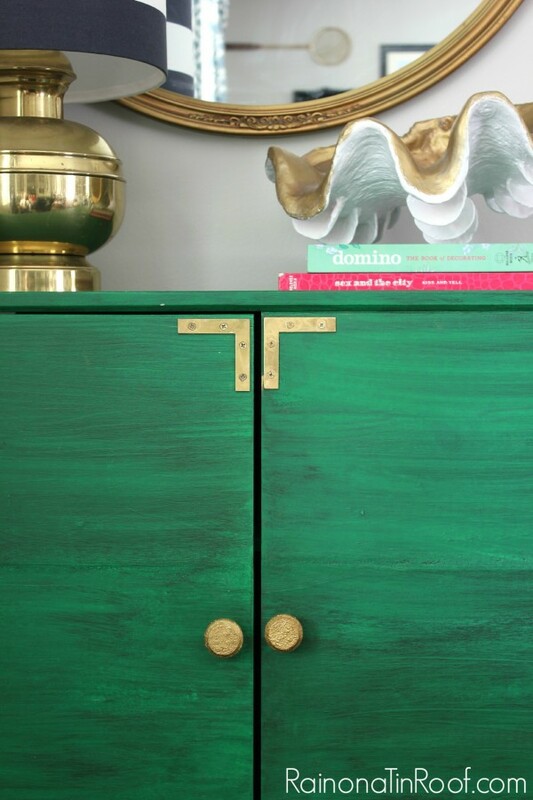 I have been wanting to try that Velvet Finishes paint – good to see your recommendation… LOVE that green color! Man, I need to win me this paint sprayer! my garage is overflowing with “paint project pieces”, LOL!! I know you understand my freakish hoarding tendencies. I hope you win the challenge, I will be voting for you!!! 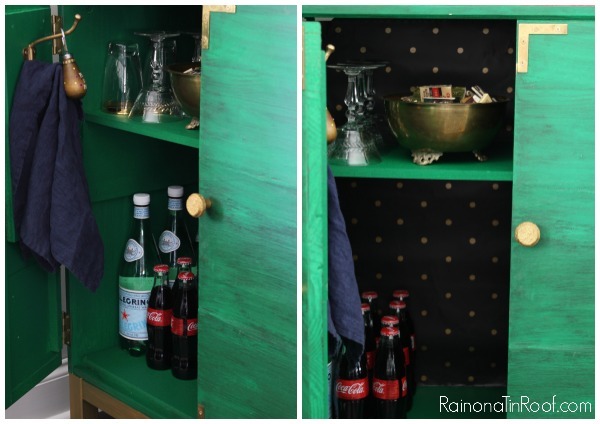 I couldn’t agree more – a booze cabinet is always a good idea! haha! 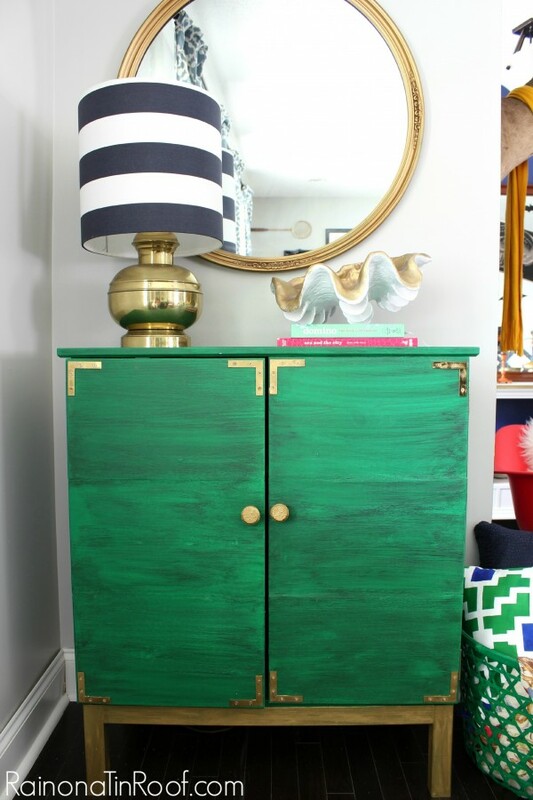 Yes, the velvet finishes paint was great – I especially love that green color! And I couldn’t have done this without the sprayer – well I could have, but it would have taken a lot longer! Good luck! I love it! And i could totally use that sprayer!! Thank you, Allie! I wasn’t sure if it would work or not, but I’m so glad it did!! Thank you! I want to refinish and paint my kids dressers and bed. A few dressers I’m preparing to redo. You have amazing creativity! I would love to win the sprayer and tackle kitchen cabinets! Thanks for the opportunity. Thanks, Patty! This would be great for cabinets! You are so inspiring!!!!! I have so many furniture that I would love to work on that the spray paint can come handy! 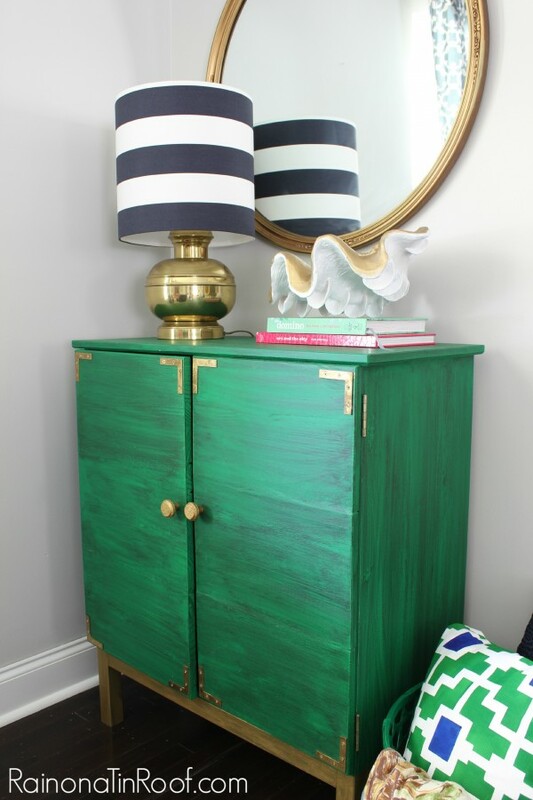 We have some nightstands I want to paint navy…with some lovely brass knobs, am I right?! Thanks, Dawn!! This paint sprayer is really simple to learn!! I have had some bad experiences with ones in the past, but this one was a breeze to use! I would use it on all the furniture in my home….I’ve wanted one of these for so long. I would paint the two dressers that are in our daughter’s room. They were mine and are dingy and dated!! I love these “L” bracket corners, gives this a wonderful Asian feel. And I really, really want that HomeRight Sprayer! Thanks, Terrie! 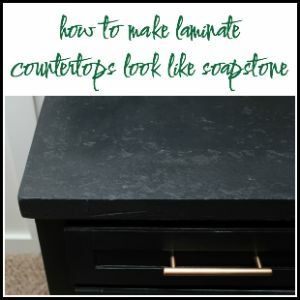 I love adding those “L” brackets to pieces – adds great character on the cheap! I am confused. How do I or where do I vote? Never mind I found out how. I am realizing that several of the accent pieces that I always pick out, all come from you! Love all the green, navy, white and gold. Love! hahaha!! 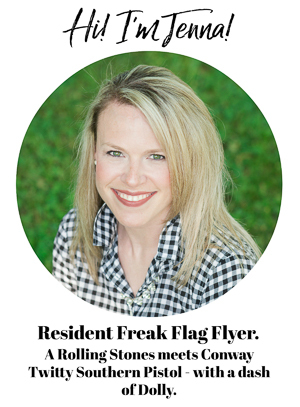 Girl, I love that combo too!! Doesn’t get any better!